We drove back to Christchurch yesterday afternoon and received a nice welcome in the form of a Mag. 5.3 earthquake just after 10.30pm last night. Thank you, Christchurch. Fortunately we were all in our newly rented caravan and the kids slept through it. The caravan is my earthquake bunker. I feel safer in there and so sleep better. 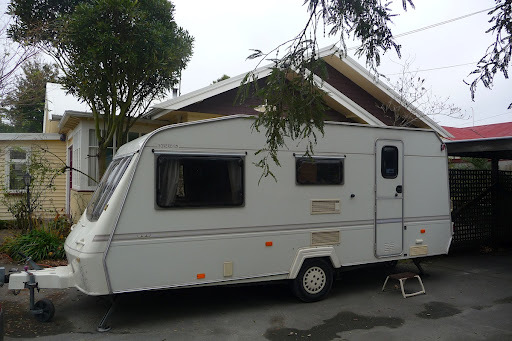 It’s a British-made caravan of more than 10 years old now but warmer and better insulated than most NZ homes. New Zealanders think they live in a tropical country and have built houses that are cold and damp in winter. The caravan is double-glazed and well insulated and has gas central heating that works really, really well. I just run an electric heater in the caravan overnight though as I don’t want us to suffocate from carbon monoxide poisoning while trying to escape death from earthquakes. The gas heating is fully flued so this is probably unnecessary. We went for a walk in our neighbourhood this morning and took some photos of damage from the Mag. 6.3 earthquake last week. I can’t see any new damage to homes but there’s lots of silt on the ground. 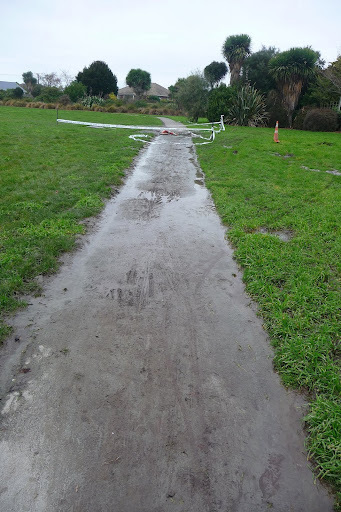 This is a result of a process called liquefaction which Christchurch residents are all too familiar with now. When the ground shakes with a degree of force, the smaller and finer particles in it rise to the surface. 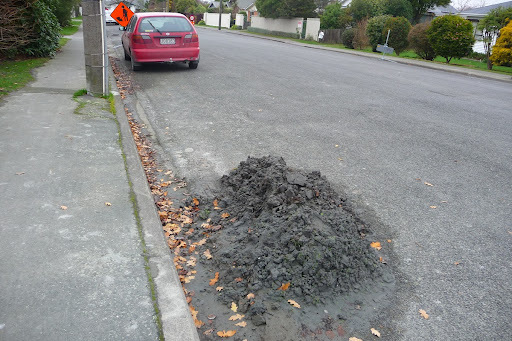 In Christchurch soils, these particles are silt and they range somewhere between sand and clay in terms of size. The whole process is called liquefaction and after each big quake, streets, homes, parks, roads – nothing is spared – are covered in silt and water. You can see how this works with a bowl of muesli if it contains particles of variable size: shake it horizontally on the bench and watch the smaller bits rise to the surface. A pile of ‘shilt’ (silt + raw sewage) outside someone’s home. Residents shovel it onto the street in piles and the council collects it. 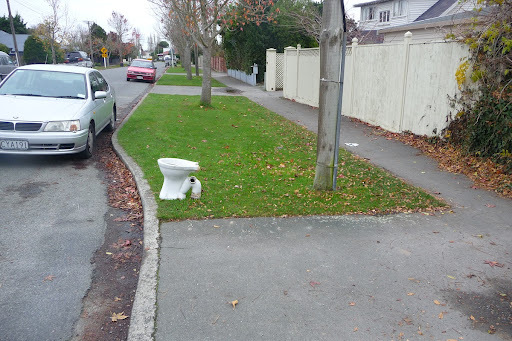 Gosh, the council is getting stingy with portaloos – they don’t even bother with walls now. The hill suburbs don’t have any silt to deal with as they rest on hard rock, but they have landslides and rock falls to contend with instead which is far more frightening in my opinion. One of the teachers at Daniel’s kindy lives on the hill and she told me this morning her home is condemned and has completely shifted off its foundations. She is currently staying with friends. Am I happy to be here? No, but what choice is there? You can’t just pack up your life overnight and leave. People here are tied to jobs, mortgages, schools, families, friends and leaving is a huge task. There are people who don’t want to leave because this is their home and they can contemplate no other. I am not one of those and have been unhappy here since September 4th 2010. I am terrified of earthquakes. Always have been. I hope you're keeping warm in your house. Aussie houses aren't particularly good for keeping out the cold either.